The most common type of incremental encoder uses two output channels (A and B) to sense position. 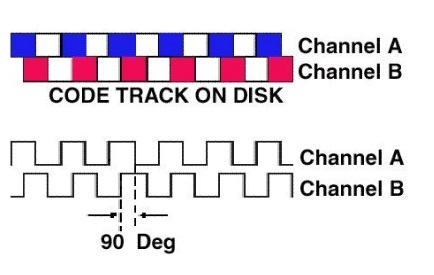 Using two code tracks with sectors positioned 90 degrees out of phase, the two output channels of the quadrature encoder indicate both position and direction of rotation. If A leads B, for example, the disk is rotating in a clockwise direction. If B leads A, then the disk is rotating in a counter-clockwise direction. By monitoring both the number of pulses and the relative phase of signals A and B, you can track both the position and direction of rotation. Some quadrature encoders also include a third output channel, called a zero or index or reference signal, which supplies a single pulse per revolution. This single pulse is used for precise determination of a reference position.